How can we communicate what the Europe lnstitutions do, here in ltaly? Who are the principal players when it comes to managing and disseminating European information? What are the shortcomings and opportunities involved? These are the questions dealt with in this book, which has been written in response to the growing needs of EU citizens for information and transparency in the conduct of European lnstitutions and the political world in general. 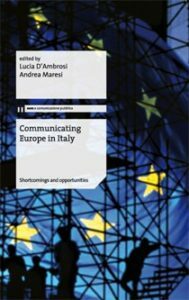 By drawing upon first-hand accounts, it explores and critically evaluates the European lnstitutions’ various means of communication and the ability of the ltalian information system to familiarize EU citizens with such questions and expand their knowledge. This is a Europe seen with different eyes, a reading which gathers together contributions from representatives of European and national institutions, from academia and the world of professional journalism. Lucia D’Ambrosi is assistant professor at the University of Macerata. She is the author of numerous books and articles on issues concerning public communication, participatory processes and new technologies. Andrea Maresi has been responsible since 2012 for media of the European Parliament in ltaly. Earlier he worked at the European Commission’s Spokesperson’s service and at the European Parliament in Brussels. He is a journalist since 2005.